Solenoid Switch - Albright SU60 12V DC 100Amp. Continuing innovation in new products keeps Albright out in front when it comes to heavy duty contactors. 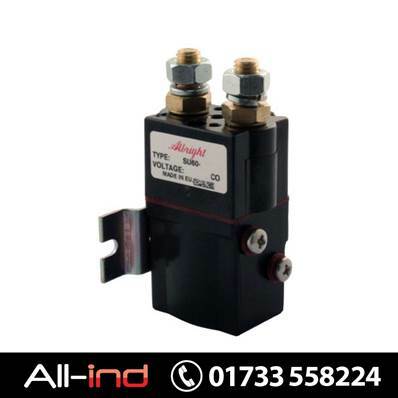 They have an unrivalled level of quality, custom products at very competitive prices, Albright International has consistently remained the market leader in the manufacture of heavy duty dc contactors. Albright International manufactures in Europe and the Far East, and together with a network of agents and distributors supplies high quality original design dc contactors throughout the world. All-ind Limited are a key UK distributor for the Albright range. We can utilise the teams of technical and design engineers that Albright employ. Albright manufacture and operate to ISO9001 and ISO14001. Albright International are able to offer tailored tail lift/non tail lift contactor solutions. For any dc contactor requirements including non taillift then contact us on 01733 558224 or call Albright International direct.